Hello, dear friends! Some of you who follow me on Instagram or Facebook, saw my exciting announcement. 😄 Tonic Studios just announced their BRAND NEW Social Media Design Team for Spring/Summer 2019. I’m incredibly proud and thrilled to be part of this! I’m looking forward to sharing my cards on the Tonic Studios blog and YouTube Channel. Today I’m sharing my first card and video on the Tonic Studios blog. In my video, I’m showing you how to create a purple sparkly ombré background with Nuvo Moonstone Glimmer Paste and the Tonic Studios Petal Pattern Stencil. Simply click the sneak peek below to be forwarded to the blog or click HERE. Hi, dear friends! 💛 Yesterday I received an email from a website Mrkortingscode.nl (MrDiscountCode in English) with some good news! 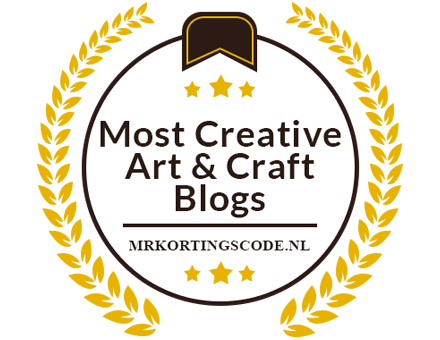 My blog is nominated for their blogger awards: Most Creative Creative Art & Craft Blogs. How exciting is that? You decide which blogger wil receive the largest prize. The full amount of €500 will be divided between the bloggers according to the percentage of votes received. The voting ends on March 13th, 2019. It would mean the world to me if you could vote for my blog. 🥰 Simply click HERE and vote! Thank you so much for your support. I’ll see you soon. Sending big, big hugs! About a day or two ago, I watched a video from Lindsay the Frugal Crafter where she’s talking about a very interesting topic. I highly recommend watching the video because there’s so much truth in it. Lately I’ve been feeling so overwhelmed in the card making industry. 😔 There are just so many new product releases and lots of fun techniques I would like to try (if we only had the time!). It’s probably because I haven’t been making that much cards lately. I missed out on so much, so I’m slowly trying to catch up with everything. Hi, friends. Long time no see! I promise I’ll be back to card making and blogging soon. Work is keeping me so busy and I’m having a hard time to find a balance between working and hobbies. 😔 When I come home from school (I’m a kindergarten teacher), I often find myself organizing new activities filling in digital documents, etc. It never stops! Take 15% off your entire sitewide purchase with code BLKF398. Take $5 off your purchase of $5 or more with code TAKEFIVE. Save up to 85% in the GRATITUDE category and the CLEARANCE category. Save 35% site wide with code THANKS. Save 20-60% off select items.